Located on the beachfront, Mantra Portsea offers luxurious modern and sophisticated accommodation within walking distance of the shopping, dining, galleries, activities and entertainment of Macrossan Street and the Port Douglas village centre. Come and enjoy a tropical escape and base yourself at Mantra Portsea on your next Port Douglas holiday. Accommodation at Mantra Portsea offers a choice of Hotel Rooms and 1 and 3 Bedroom self-contained Studios and Apartments. 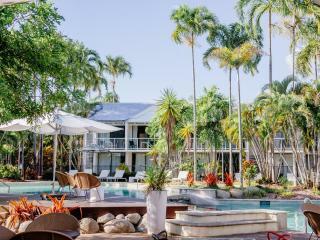 Making use of the fantastic natural lighting, this Port Douglas accommodation also offers air conditioning, garden views, kitchenettes, a spa bath and private balconies. Mantra Portsea is also home to an outstanding range of onsite facilities including an expansive central lagoon pool, swim up bar, waterslide, spas, waterfalls, tropical gardens, solar heated lap pool, plunge pool, BBQ facilities, a fitness centre, tennis court, tour desk, day spa and much more. Explore the stunning beauty beyond the resort in the Great Barrier Reef or Daintree Rainforest on a local day tour. Alternatively stroll through Port Douglas village and discover the many shops, cafes and art galleries, or head off on a long walk along Four Mile Beach. The options are endless at Mantra Portsea. Accommodation at Mantra Portsea offers a range of Hotel Rooms and 1 and 2 Bedroom Studios and Apartments. Hotel Room: Bedding is 1 King Bed. Maximum room capacity is 2 Adults & Children. 1 Bedroom Studio: Bedding is 1 King Bed OR 1 Queen Bed OR 2 Single Beds. Maximum room capacity is 3 Adults & Children. 1 Bedroom Studio Lagoon: Bedding is 1 King Bed OR 1 Queen Bed OR 2 Single Beds. Maximum room capacity is 3 Adults & Children. 2 Bedroom Apartment: Bedding is 1 King Bed + 1 Queen Bed OR 1 Queen Bed + 2 Single Beds. Maximum room capacity is 5 Adults & Children. 2 Bedroom Apartment Lagoon: Bedding is 1 King Bed + 1 Queen Bed OR 1 Queen Bed + 2 Single Beds. Maximum room capacity is 5 Adults & Children. 2 Bedroom Dual Key Apartment: Interconnecting hotel room and one bedroom studio. Bedding is 1 King Bed + 1 Queen Bed OR 1 Queen Bed + 2 Single Beds. Maximum room capacity is 5 Adults & Children. 2 Bedroom Lagoon Dual Key Apartment: Interconnecting hotel and one bedroom studio. Bedding is 1 Queen Bed + 1 King Bed OR 1 Queen Bed + 2 Single Beds. Maximum room capacity is 5 Adults & Children. Breakfast Room: serving a tropical continental buffet breakfast daily. Pool Bar: Open Friday to Saturday from 3.30 pm - 5.30 pm for snacks, drinks and dinner items to be enjoyed poolside or take away. Accommodation at Mantra Portsea also offer self-catering facilities however the bars, cafes, restaurants and dining options of Port Douglas are just minutes from the resort.